TICKETS are $5 per person at the door. No advance sales. As a holiday treat, dancers from the Portland Ballet will perform excerpts from their production of Tchaikovsky’s beloved ballet. 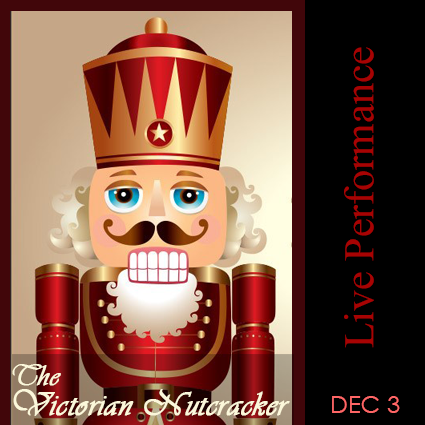 This representation of about a dozen dancers, will appear in full costume in selections from the Ballet’s complete production of “The Victorian Nutcracker”. CHILDREN ARE WELCOME, and may be invited from the audience to chat with the dancers and try out a few dance steps. Join us for this Christmas classic, live on stage at the Dunaway Center! A reception with refreshments will follow the performance. Following the presentations of his ballets “Swan Lake” and “Sleeping Beauty”, Tchaikovsky was commissioned by the Direction of the Imperial Opera to compose a double-bill program featuring both an opera and a ballet. Alexandre Dumas Père’s adaptation of the story by E.T.A. Hoffmann was set to music by Tchaikovsky and originally choreographed by Marius Petipa. The first concert presentation of “The Nutcracker” in 1892 was a great success, although the ballet itself took considerably longer to take hold. Over the years, however, the Sugar Plum Fairy, and the music of the celesta to which she danced, has ensured “The Nutcracker” as the favorite Christmas presentation of ballet companies around the world. Steeped in tradition, Portland Ballet’s annual production of “The Victorian Nutcracker” recreates the interiors of Victoria Mansion and interprets Tchaikovsky’s score through the stories of Portland’s nineteenth-century families. This audience favorite is unique among Nutcracker performances across the nation and continues to be a mainstay of Portland’s winter arts season.